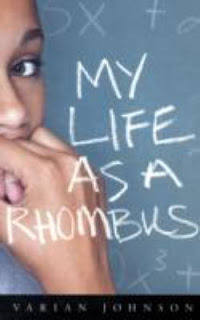 The other day I completed My Life as a Rhombus by Varian Johnson. The author is a young (to me anyway) male writing from the female protagonist's point of view. That isn't so unusual, but the character Rhonda has a history that she can't forget, and the author does a nice job with her. She is a star student at a private school for mostly African Americans in South Carolina. She gets pregnant in her freshman year and is forced to have an abortion by her father. She spends the rest of high school focusing on academics. The novel begins during her senior year. She reluctantly agrees to tutor a fellow student who happens to be pregnant. The story goes from here. The author does not really take a stance on abortion, but it is a big part of the story. I enjoyed it, and I think my high school girls will too.